Mountain Swim Series reserves the right to cancel any event due to unsafe weather conditions, unsanitary water conditions, or other reasons. The safety of the participants, volunteers and spectators is of utmost importance to us. Prolonged or heavy rainfall before or on the day of the race will likely lead to a cancellation as there may be trash, untreated storm water runoff, and sewage overflows entering the water rendering it unswimmable for several days. 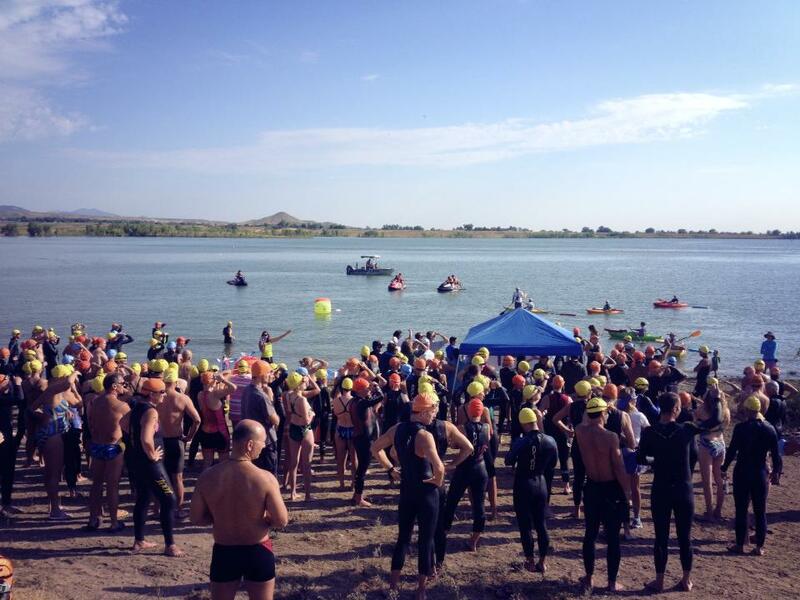 Mountain Swim Series does not provide refunds for swim event cancellation or entry withdrawals. Our fees cover police services, mandatory insurance and permit fees, web services, data base maintenance, advertising, printing and mailing, swim caps, awards, professional water safety services required by the permit process, timing services, equipment rental, communications and sound system services, volunteer tee shirts, and race day operations. To put it quite simply, the bills must be paid even if the race isn't held. Trust us – we want to hold an event and will do everything in our power to hold an event. If purchasing tee-shirts, tee-shirts must be picked up on the day of the event. Participants are encourage to register before the race online. Pre-registration aids us in financing the event, ordering materials as well as getting a good idea of how many participants to expect so that the event can be planned accordingly. Because we recognize that peoples schedules are fluid, we offer same day registration at a cost of $10 per registration in addition to the pre-registration race amount. Lifeguards and kayakers will be patrolling and monitoring the course and a medical team will be available to assist in case of a medical emergency. If choosing to wear a wetsuit, be sure to have swam in that specific wetsuit prior to the race. Wearing an ill-fitting (too-tight) wetsuit can be dangerous. All competitors must be competent swimmers, and should undertake the appropriate training in preparation for this event. Any person signing up for these events should be a competent swimmer and be able to consistently hold a 2:30 per 100 yard pace or faster. Swimmers enter the races and the water at their own risk, are responsible for their own physical condition and are encouraged to seek the advice of a medical practioner before entry. The Organizer will make every effort to ensure a safe event. Please refer to the Assumption of Risk and Waiver of Liability for more information. All swimmers must be present at the race-briefing for their relevant event. Water Safety craft will be patrolling the course for all races. Medical specialists will be on site to administer first aid if required. Swimmers must comply with directions given by officials and/or safety personnel. Swimmers are asked to be courteous to fellow competitors and assist if they see other competitors in distress. Swimmers should be aware that hydration is very important pre and post race. Both HYPERthermia and HYPOthermia can occur during swims. Know the warning signs, your limitations and practice with any wetsuit prior to the swim. Swimmers must attend their race briefing. All race briefings will be held minutes prior to the race warm up. Swimmers must start the race within the designated areas as indicated in the race briefing. Latex swim caps are required and will be supplied at the registration. Swimmers must be capable of completing the full distance that they have entered. If you are unsure of your ability, enter a shorter race. Hanging onto support craft is not permitted and will result in disqualification. Swimmers must follow course buoys as instructed in the pre-race-briefing. Disqualification may occur if this rule is not abided by. Un-sportsmanlike behaviours will not be permitted and will result in disqualification. Swimmers are not permitted to have their own personal support craft on or around the course. If family or friends wish to volunteer for our events please click on the volunteer link above. The organiser has/holds the right to remove or prevent someone from starting or completing the event at their discretion, and any decision made by the Event organizer is ULTIMATE AND FINAL. If conditions are not appropriate for the safe undertaking of the event, it may be delayed, moved to a different course on cancelled. If you require assistance during the swim or observe any other athlete in distress raise one arm so our water safety personnel can assist. 13 years old (on race day) and up (special exceptions may be made if a younger swimmer can demonstrate competence in the water). For Women, a wetsuit will be classified as any suit which one might wear a second swimsuit under or any swim suit extending past the shoulders, below the knees, which is made of neoprene or a similar non-porous material or which may provide swimmer assistance. For example, swim skins shall be classified as wetsuits. Also, any zippered suit shall be classified as a wetsuit. For Men, a wetsuit will be classified as any suit which one might wear a second swimsuit under or any swim suit extening above the waist, below the knees, which is made of neoprene or a similar non-porous material or which may provide swimmer assistance. For example, swim skins shall be classified as wetsuits. Also, any zippered suit shall be classified as a wetsuit. Swimmers will be checked for their suit as they exit the water. Swimmers are requested to confirm their intention on whether to wear a wetsuit or not at race registration on the day of the swim. Changing it before the swim makes it easier for the volunteers. Signing up for an event authorizes the Mountain Swim Series to send event updates, registration info, and other Mountain Swim Series information to you. We will do our best not to spam you with unnecessary emails but if you would like to unsubscibe from our list, please either unsubscribe through the email or contact Karl or Kim at mountainswimseries@gmail.com.